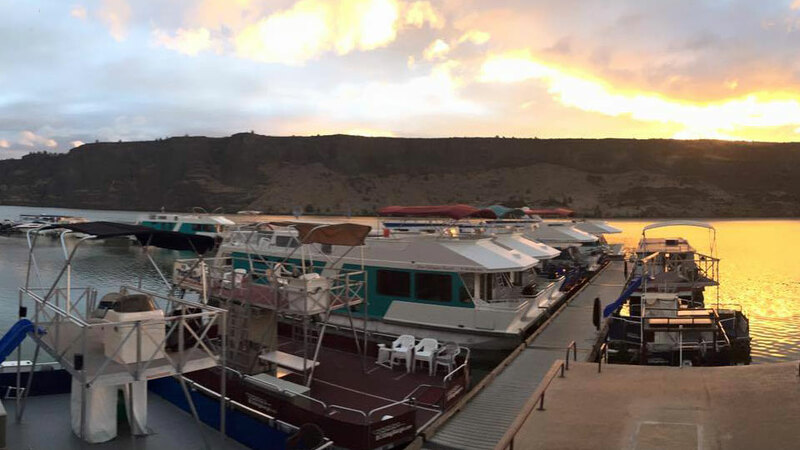 Just a 45 minute scenic drive north of Bend lies the houseboating, water skiing and fishing mecca known as Lake Billy Chinook. Fed by the Deschutes, Crooked and Metolius Rivers, Lake Billy Chinook offers three unique arms and over 72 miles of shoreline, and it’s here you’ll find Cove Palisades Resort. Open late spring through early fall (check web site for specific dates and for reservation information) the full-service resort specializes in renting houseboats, ski boats, fishing boats, pontoon boats, wave runners, kayaks, pedal boats and all the water toys. No boater’s license? No problem. Free temporary licenses are available for rental customers. If you’re planning to stay for a few days to be awed by the Cascade Mountain Vistas, basalt spires, soaring bald eagles and the steep canyon walls, luxury houseboats offer all the conveniences of home. Equipped with hot tubs, TVs, coffeemakers, cd stereos with Bose speakers, propane barbecues, water slides, air conditioners, spacious floor plans, and able to accommodate up to 15 people, these swanky floating digs are in a class all their own. If you like to play on the water all day but prefer to sleep on land at night, there are several nearby state-owned campgrounds and cabins for rent. Daily and summer moorage, a cafe and a fully stocked store round out the resort’s amenities, and the friendly, highly trained staff is ready to make sure you have the vacation of a lifetime.